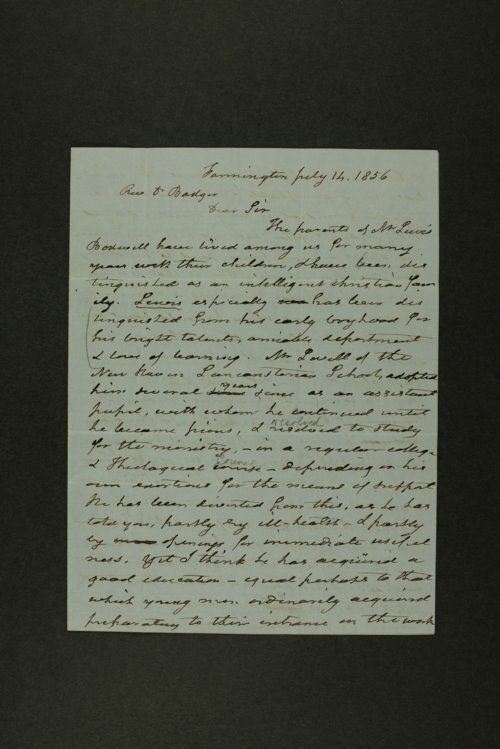 This collection consists of letters of recommendation and correspondence to and from Lewis Bodwell, the first resident pastor of the First Congregational Church in Topeka. The collection also includes Bodwell's diary and list of marriage ceremonies performed in Topeka from 1863-1873. Correspondence is arranged chronologically. The last item in the page selection list is labeled notebook and it is the diary covering the years 1863-1873. Bodwell, the son of Mr. and Mrs. Anson G. Bodwell, was born in Connecticut and moved to Topeka during the territorial era. He acted as the state superintendent of missions for the American Home Missionary Society. Eventually he moved to Clifton Springs, New York.